To print images onto plastic cards, card printer uses dye sublimation technology. The dye sublimation process uses three panels (YMC) for colour and one panel (K) for black. YMC are used for colour picture and K for black text. An overlay panel is used to protect colour picture and text from wear and tear. Colour printing used colour ribbon composed of yellow, magenta and cyan panel. The plastic card is passed through a thermal print head together with colour panels. The colour from the panel is then transferred on to the cards though the heat given out from the print head. The standard performance for card printing is 300dpi (300 dots per inch equivilent to 11.8 dots per mm). This process makes it possible to optimize the excellent quality of printed images and logos. Monochrome printing uses a single colour such as black, white, blue, red, gold, silver etc. This is the most cost-effective method to personalize with pre-printed cards. It is the ideal solution for cards printing that do not require colour picture. Monochrome is often used to print barcodes. 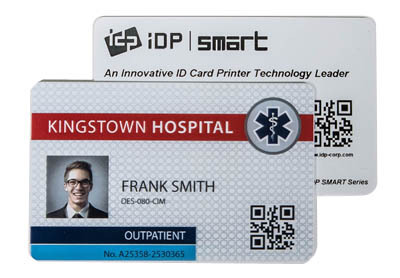 SMART ID Card Printer has one of the latest technology in card printing. PVC cards (Plastic Cards) need more than just traditional printers, due to their polished nature. SMART ID Card Printer uses a process called Thermal Transfer, to cater specifically to these type of cards. This process of Thermal Transfer is self-explanatory. A coloured ribbon from the printer is placed on the sleek surface of the card, and a thermal print head will heat up the ribbon. This layer of colour will evaporate due to the high heat, but instantaneously turns back to its solid state once it reaches the surface of the card. Thus, an image or colour is formed on the card. It is a standard performance for card printing to be 300 dpi (300 dots per inch, equivalent to 11.8 dots per mm). 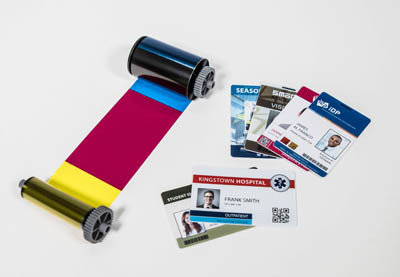 SMART™ID Card Printer offers an array of printing ribbons, to make sure that a design for a card is only limited by imagination, not by the number of colours. Besides the usual monochrome ribbons, various colour ribbons are also available, each with their own unique printing options. 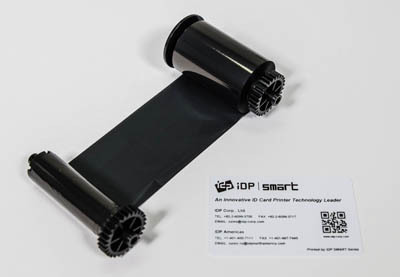 Some featured SMART™ID Card Printer’s ribbons includes BYMCKO Ribbon, a full-colour printing ribbon capable of producing high quality graphics, and also includes an overlay panel on the cards, protecting it further from wear and tear. Another interesting feature is the YMCKFO Ribbon, which is capable of printing ultraviolet (UV) graphics, to be used as a security feature by companies. The thermal transfer process is mainly used to personalize pre-printed plastic cards in monochrome. The color is “transferred” from the monochrome (black, gold, silver, red, blue, white etc.) ribbon onto the card. The dye sublimation process uses four panels – CMYK color ribbon. During printing, the plastic card passes under the thermal print head several times and each time with the corresponding ribbon panel. Each color (Cyan, Magenta, Yellow, Black) in turn is sublimated directly onto the plastiic card. In this way, it is possible for production of a high depth of color (up to 16 million shades) on the card. In the final step of printing, a transparent overlay (O) is placed over the card to protect it from mechanical wear and tear and to render the printed image UV resistant.